Via Wired, I'm reminded that it was 63 years ago today that the world saw its first atomic bomb blast. I'd been doing some thinking lately for a research project chronicling historical developments that were once thought impossible, and, from my understanding of the history of nuclear weapons (based, I'll admit, probably a bit too much on Copenhagen), it would seem that harnessing the power of the atom for explosives or for power generation would fall in that category. The fact that today is also the 39th anniversary of the launch of Apollo 11 blended with this forgotten atomic anniversary in my mind. 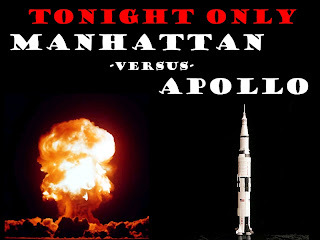 Then I started doing a mental comparison between the Manhattan Project and the Apollo Project. There are some immediately obvious, superficial similarities, of course. Both were massive technological programs taking on challenges that only a few years prior were thought to be impossible. Both were driven in large part by geopolitics, and took place in an environment of an extremely high stakes race. Both were undertaken in the USA, but relied heavily on work done in Germany or by those who had previously lived and worked there. And, in the two, we have perhaps mankind's proudest and most horrific moments. Two monumental technical achievements, about a generation apart, each of which left an indelible mark on the minds of billions of people around the world. From the fact that Apollo followed Manhattan, we can conjecture that whatever "secret sauce" served to make projects of this scale technically successful is something recreateable. The conditions we similar, but not identical. It is possible to believe--perhaps, for those of us in the USA, even easy to believe--that with the right preparation, study, and force of will, we can begin and complete other technological projects on a similar scale. This idea has been kicked around a fair amount, lately. Politicians here in the USA often talk about a "new Apollo project" or a "new Manhattan project," often in the context of a program for developing energy independence. As pointed out by the Financial Times some individual fortunes and philanthropic organizations are now growing to the scale where they can run new Manhattan projects of their own. And prizes like the ones the X PRIZE Foundation offers are certainly a step in this direction. So this week, as we celebrate the anniversary of the Apollo 11 and recall the Trinity test, it is a good time to reflect on the marvelous capabilities of human ingenuity, and to ponder what big projects should occupy the minds and hearts of humankind next. i'm sorry, i had to.